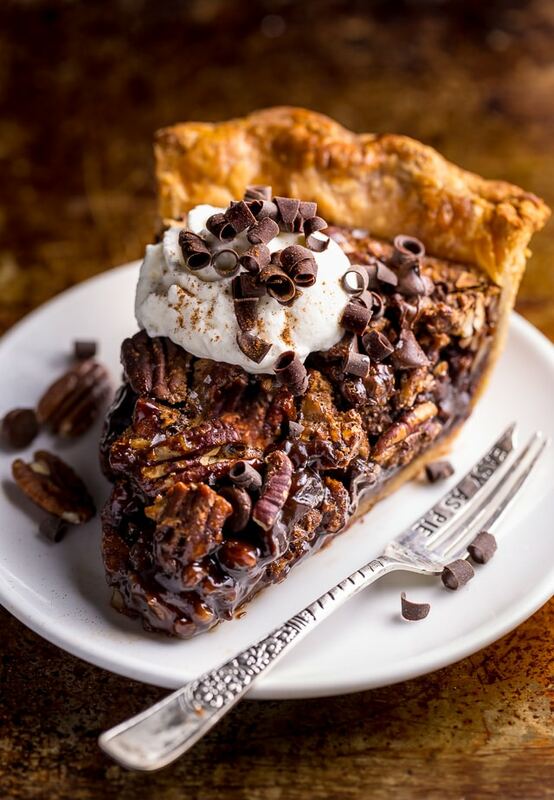 This insanely decadent Chocolate Pecan Pie is topped with a dollop of whipped cream… and extra chocolate, of course! The perfect pecan pie for a chocolate lover! As you know, chocolate desserts are my weakness. So excessively testing this recipe was pure bliss! Just don’t tell my dentist I said that… I literally had a cavity filled this afternoon. (embarrassing but true!). Pecans – duh! Just a little tip: always taste your pecans before adding them to the filling to ensure they’re fresh. Nothing ruins a pie like rancid nuts! Chocolate: adds flavor and creates a thick filling. Flour: to absorb some of the liquid ingredients (no one likes a soggy pie!). Cinnamon: to compliment the chocolate and give the filling a touch of spice. Light corn syrup: helps create a smooth filling by preventing sugar crystallization during baking. Butter: browned butter, to be exact! Which adds a slightly nutty flavor that plays well with the other flavors in the pie. Kahlúa: enhances the chocolate flavor! 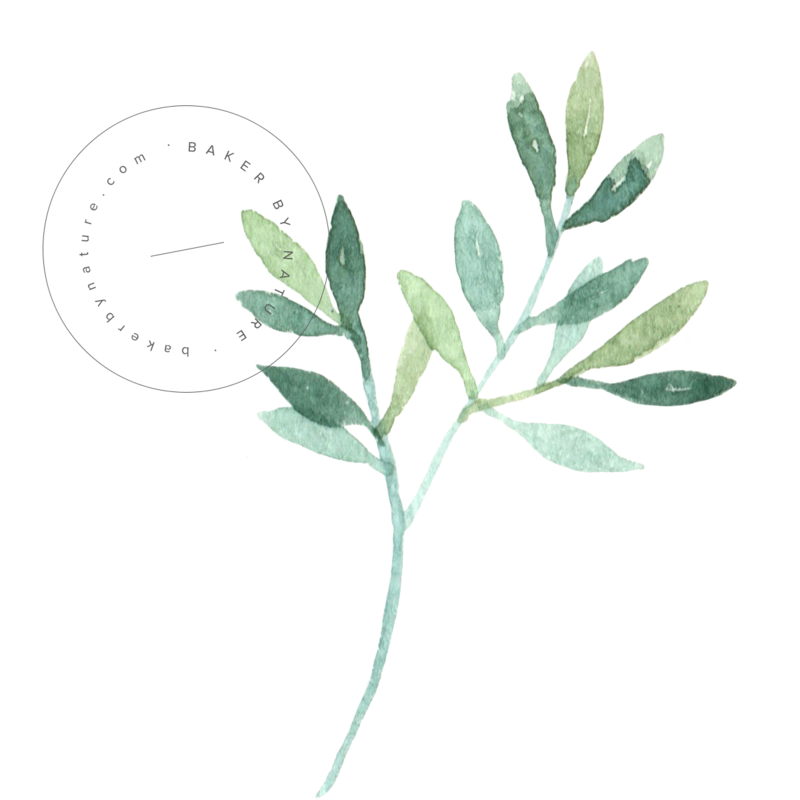 Salt: keeps the pie from being overwhelmingly sweet. And that’s it! 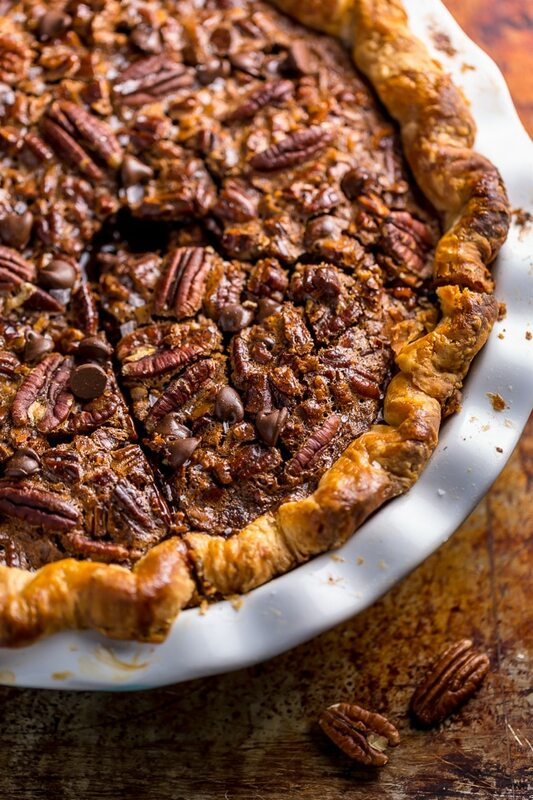 You’re just 10 simple ingredients away from baking this chocolate pecan pie in your kitchen. Actually, make that 12 ingredients! Because you’ll need pie crust and whipped cream, too. For the pie crust, I used my beloved all-butter pie crust. And I suggest you do the same! It’s a dream come true. Try it once… make it forever. Trust me! And for the whipped cream, I use this simple recipe. Of course, you can also just use canned whipped cream. But with a pie this glorious… why not take the extra step and have the real deal? If you don’t like Kahlúa, or don’t consume alcohol, you can omit it from the recipe without making any other changes. Before baking, place your pie plate on a parchment paper lined baking sheet. The baking sheet makes handling the pie safer and easier, while the parchment paper will catch any spills that might occur while baking. Let your pie cool completely before slicing it. This takes 6 hours, so plan ahead time wise! For best results, you’ll want to let your pie cool for 3 hours on a wire rack at room temperature, and then at least 3 hours in the fridge. This helps the filling set, and ensures you won’t be slicing into a runny mess. How to Tell When Pecan Pie is done? It’s also important you bake your pie long enough. 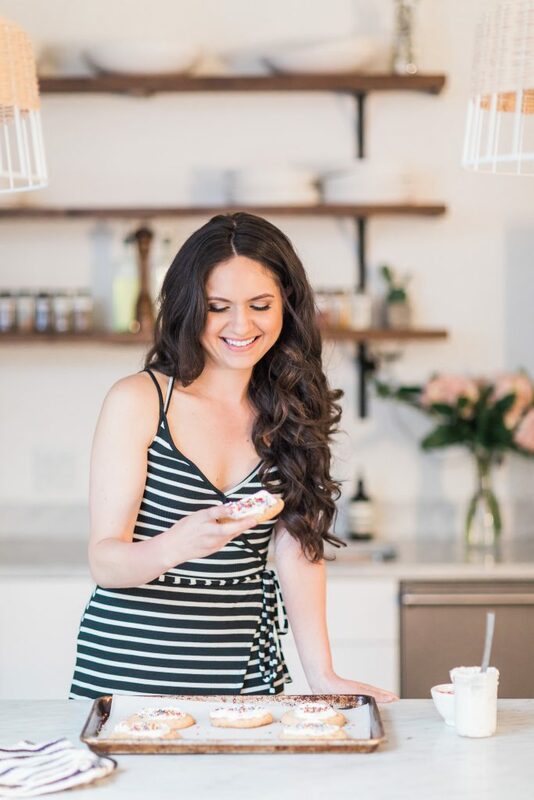 I’ve included a rough estimate of how long it will need to bake, but everyone’s oven runs a little differently, so you may need to add 10 to 15 minutes to the bake time. Visually, the center of the pie should be puffed up, set at the edges, and just a little jiggly in the center. If the center is very jiggly, pop it back in the oven for at least 10 more minutes. Under cooked pies will be runny. To avoid over browning, bake this pie on a rack positioned in the lower third of your oven. I also suggest loosely tenting a piece of tin foil over the pie after 25 minutes of baking. You could also use a pie crust shield. 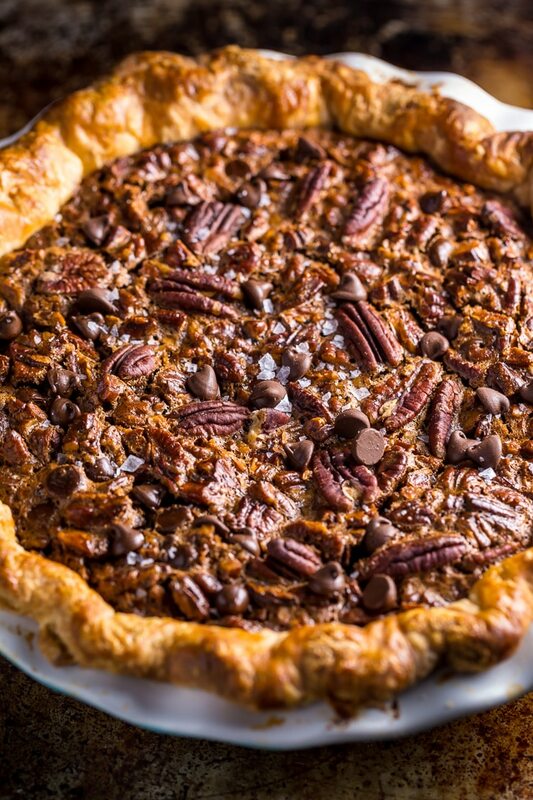 Want to serve your chocolate pecan pie warm? Here’s what I suggest doing: allow your pie to cool completely, then reheat it right before serving. To reheat individual slices, warm them in the microwave for 25 to 30 seconds; to reheat an entire pie, warm it in the oven, at 350°F (177°C), for about 15 minutes. 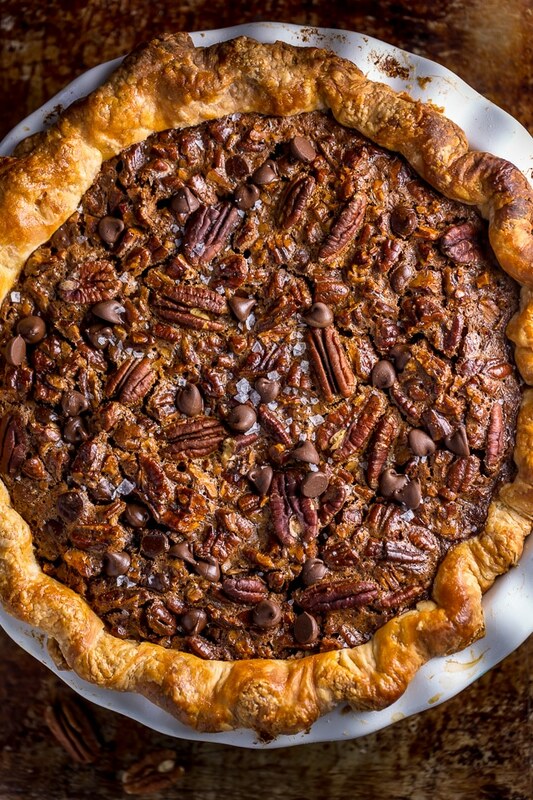 Crunchy, gooey, buttery, chocolatey pecan pie perfection! Are you craving this yet?! Better question: are you making this yet?! 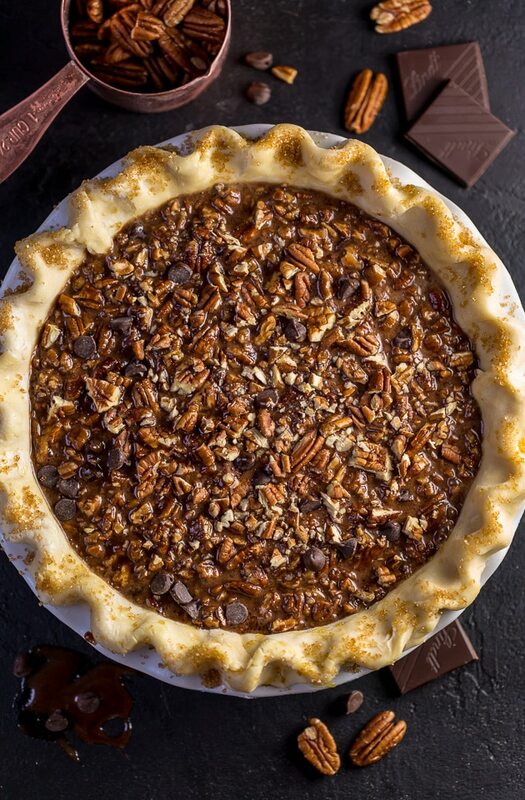 If you try this recipe for Chocolate Pecan Pie, leave a comment below and don’t forget to snap a pic and tag it #bakerbynature on instagram! This insanely rich and decadent Chocolate Pecan Pie is a holiday favorite! Serve with whipped cream and extra chocolate shavings! Preheat oven to 350°F (177°C). Have ready and refrigerated one pastry-lined 9-inch pie plate (see foolproof all-butter pie crust). Fill a medium pot one-third full with water and bring it to a low simmer over medium heat. Place a heatproof bowl that will fit on top of the pot snugly, but will not touch the simmering water, on top of the pot. Reduce the heat to low and add the chopped chocolate into the bowl over the pot. Heat until the chocolate is completely melted, stirring occasionally with a silicon spatula. Remove the pot from heat, leaving the bowl over the pot. Set aside until needed. In a medium mixing bowl, whisk the eggs until well combined (make sure the yolks and whites are fully blended). Whisk in the brown sugar, breaking up any lumps in the mixture. Whisk in the corn syrup, browned butter, Kahlúa, salt, cinnamon, and flour. Using a rubber spatula, fold in the pecans and chocolate chips. Fold in the melted chocolate. Pour the filling into the prepared crust. Then if desired, line the top of the filling with extra pecan halves. Bake for 65 to 75 minutes, or until the center is puffed, the edges are set, and the center is just a little jiggly. If the top of your pie is getting too brown, loosely tent a piece of tin foil on top. Place pie plate on a wire rack and cool completely (about 3 hours) before transferring to the fridge to chill for at least another 3 hours. Store pie, covered in the refrigerator, for up to 5 days. Serve cold, or bring back to room temperature before serving. 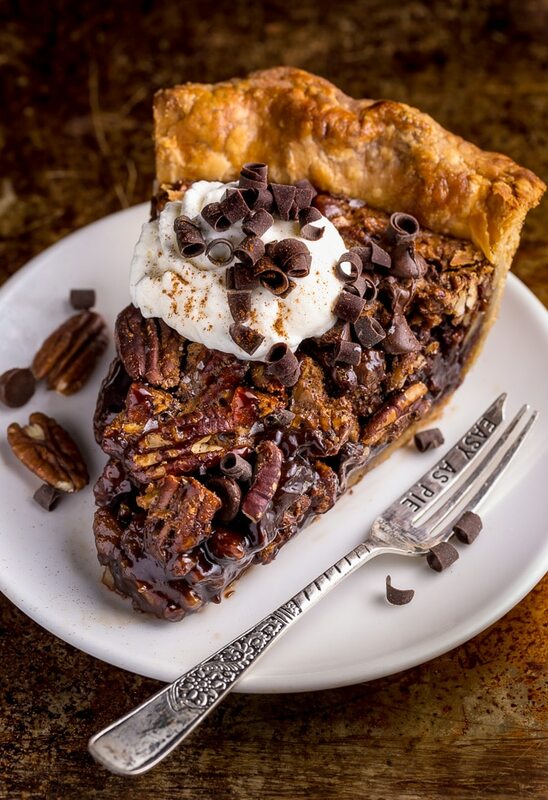 oh girrrrl this is the ULTIMATE pecan pie-all that gooey chocolate has me drooling! As of the writing of this comment, I have not tasted it because it is still in the “cooking process”, but it looks and smells good! 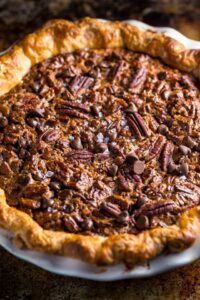 There are many Chocolate Pecan Pie recipes, but I tried this one because it looks more sophisticated than some of the others. Other than using a different pie crust recipe, not browning the butter, and no addition of the Kahlúa, I followed the recipe exactly as it is written. I plan to serve the pie with a Chantilly Cream after Christmas dinner. Adding this to my Thanksgiving menu because CHOCOLATE!!! No need to blind bake the crust correct? All goes in raw ? I have milk chocolate chips on hand. Do you think that will work instead of semi sweet? Can I replace the corn syrup for maple syrup or honey? Do you prick the pie crust before adding the pecan chocolate filling? Great pecan pie! Almost never find myself saying this but It had too much chocolate–similar to when you’re making chocolate chip cookies and instead of adding just a cup of chips you add a bag and a half and the dough is barely holding the chocolate together into a cookie. Not the worst thing in the world. 🙂 Will definitely make again but next time will only add one of the chocolates. Probably just the melted portion (which mixes with the batter to make a caramel filling) and not the extra chips or a lot less of them at least. The chips didn’t melt (I used ghirardelli chips which are a bit larger btw.) If you only add the chips you’ll prob have a regular pecan pie with chocolate chip bites throughout which also sounds amazing. No comment on the crust recipe. I used a dif crust. I didn’t cook it before filling and it turned out great. It’s in the oven now!!! Smells divine. The crust recipe was so easy to work with. Thank you!